We have created a number of luxurious villas utilizing the experience we gained over the years of running a hotel. 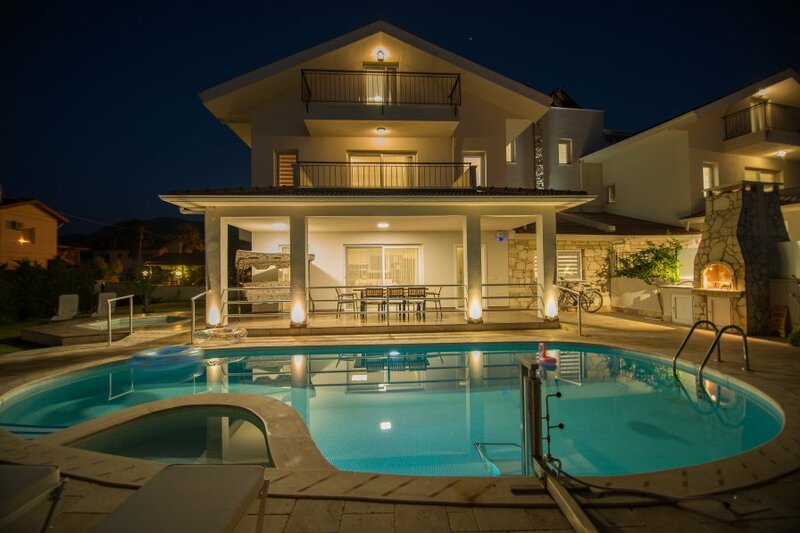 The villas are located next to each other, only a few hundred meters from our hotel. Crescent White is a 4-bedroom villa with its own private pool and garden. 3 of the bedrooms are en-suite and the 4th bedroom has a separate bathroom. Crescent White is located approximately 800m from the village centre, surrounded by private villas. A big supermarket is only 400m from the villas. The villa has its own private swimming pool with step free access to the terrace, travertine poolside decking and green grass garden. Leylandii hedges around the neighbouring walls create a secluded garden while letting the sun in the westerly facing garden. The villa has a spacious air-conditioned open plan kitchen and living room with dining area on the ground floor. The living room is furnished with high quality comfortable sitting set, 42” satellite TV with surround sound system & a DVD player and free Wi-Fi. There is a twin bedroom also downstairs and a bathroom with spacious open shower and toilet. The living room opens up to the terrace and the swimming pool. The private swimming pool is chemical free and has a separate Jacuzzi and children’s pool. It is surrounded by grass and sun loungers and cleaned daily. For the safely of young families a light and secure aluminium fence is available on request to surround the pool area. If you are feeling adventurous there are two bicycles for your pleasure, or just relax in one of the sun loungers while waiting for your lunch to cook on the barbecue. The kitchen is fully equipped with all modcons, including a gas hob, oven, microwave, dishwasher and a coffee machine. The kitchen has all items needed to cook and serve a meal, giving you the comfort and practicality of your own home. A utility room with washing machine, iron and ironing board is located downstairs. On the mid-floor you will find two large en suite bedrooms. The top floor luxury suite comes with a super king bed, en-suite and large balcony over looking the pool. All rooms are air-conditioned, with ample storage, TVs and balconies. Dalyan is a pretty safe place however, the villa is equipped with an alarm system and a safe is provided for peace of mind. The villa is cleaned twice a week, bed linen and towels are replaced during the cleaning. Two sets of towels are provided per person for shower and swimming pool use. Every room and the living room have one UK type power sockets for your convenience. The villa is purpose designed and constructed to be wheelchair accessible. Three of the bathrooms have wheel-in showers, extra wide doors, a lift to access upstairs and pool lift to name but a few of the accessible properties. Our hotel is located only 400m from the villa and we arrange local tours and activities for our hotel guests, this service is available to all villa guests. For large groups both semi-detached villas can be hired together.